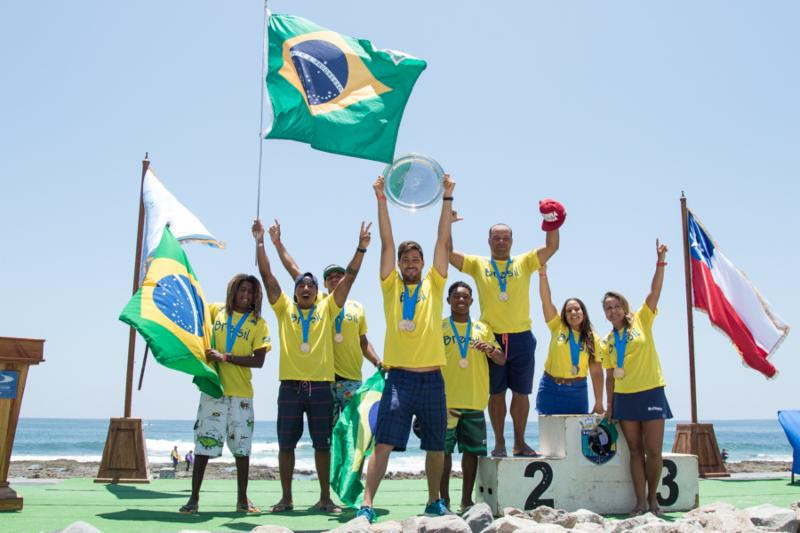 Iquique, Chile, December 13, 2015 - After five days of intense competition at la Punta Uno, Team Brazil claimed the Team Gold Medal at the 2015 Iquique Para Todos ISA World Bodyboard Championship. Trailing Team Chile heading into the Final Day, Brazil was able to seize first place behind a strong team performance headed by Eder Luciano's Gold Medal. Japan's Shiori Okazawa (Girls U-18), Venezuela's Luiz Rodriguez (Dropknee), Chile's Yoshua Toledo (Boys U-18), France's Anne Cécile Lacoste (Open Women) and Brazil's Eder Luciano (Open Men) prevailed with the individual Gold Medals after a string of nail-biting Finals. ISA World Championship experience proved to give some competitors an edge in the Finals, as four of the five champions were past ISA Gold Medalists. 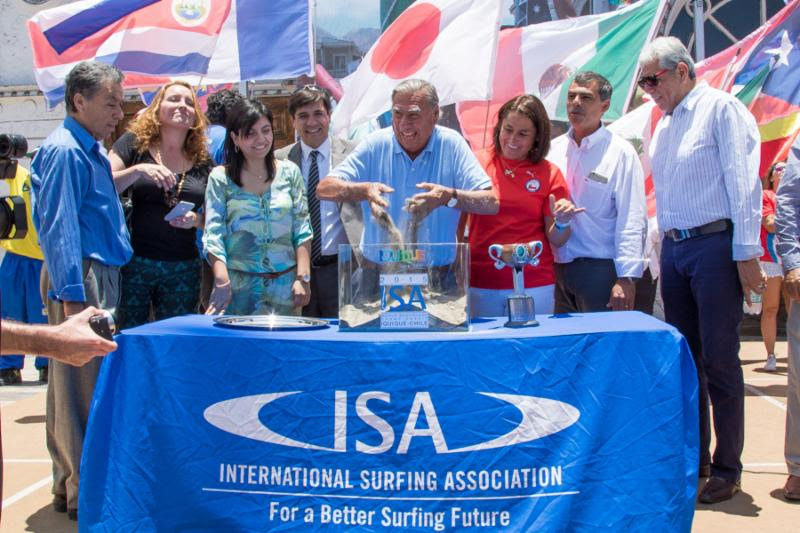 "I want to send my warmest congratulations to the dear city of Iquique, Mayor Jorge Soria, Iquique's City Council and all the participants for the excellent competition this week with amazing waves. 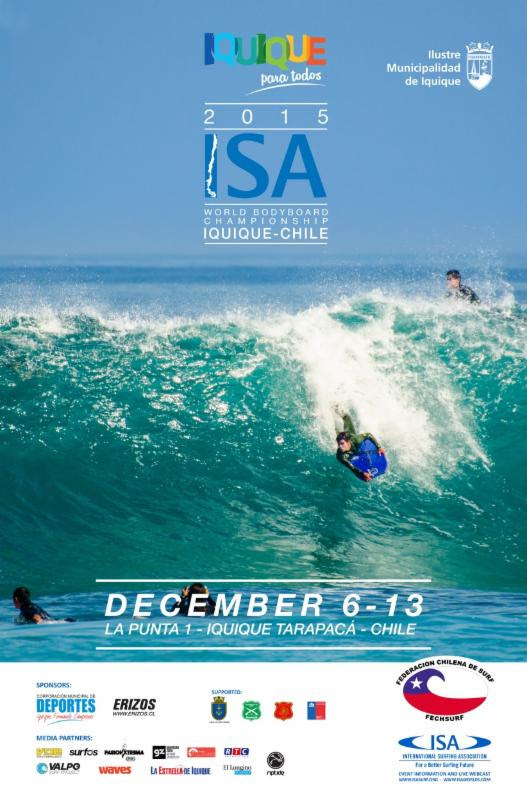 The ISA World Bodyboard Championship will say farewell to Iquique after two incredible years, but the ISA will return to Iquique, as the city leaders and the ISA have agreed on the hosting of the 2016 ISA World Master Surfing Championship. Not only did we make history here in Chile, but we made friendships, progressed the sport of Bodyboard and united the international Bodyboard community. Muchas gracias Iquique." Sunday morning's action kicked off with clean, sunny conditions at Punta Uno as the Repechage Finals in each division decided who would move onto the Grand Final. In the Boys U-18 Repechage Final, France's Milo Delage scored the first 10-point wave of the day, getting spit out of one of the most solid barrels of the morning and earning a spot in the Grand Final. Iquique, Chile, December 12, 2015 - Team Chile jumped into the lead of the team point ranking on the fourth day of competition at the 2015 Iquique Para Todos ISA World Bodyboard Championship, determined to defend their 2014 title. Chile's potential point total of 6,310, put them out in front of second place Brazil, with 6,273 potential points, and third place France, with 5,913. Saturday morning got off to an electric start when the Under 18 Boys took to the water in the first Main Event heats of the Day. 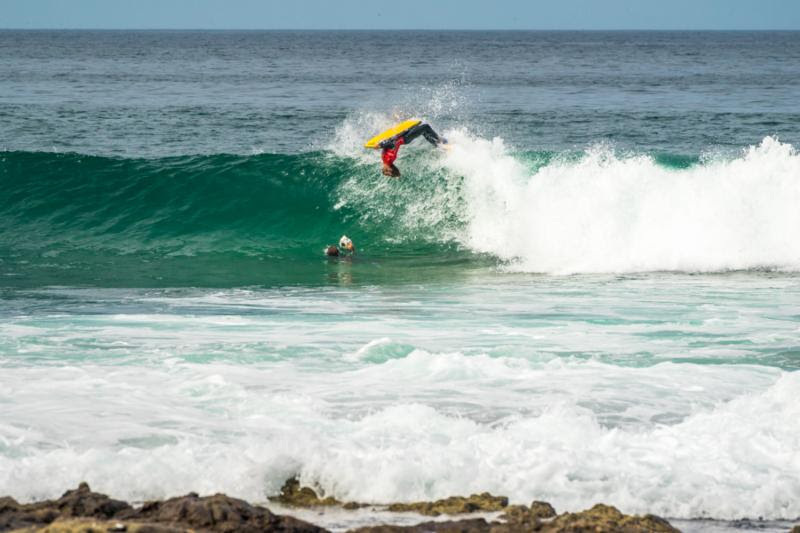 The defending Gold Medalist, Iquique's own Yoshua Toledo, continued to apply his local knowledge of la Punta Uno and lead the charge for Team Chile. Toledo combined two high scores of 7.33 and 8.67 to advance to the Grand Final along with Portugal's Stephanos Kokorelis. Toledo is one of three Chileans who have earned spots in their respective Grand Finals, with three other teammates battling through the Repechage Round. The competition proceeded with intense heats in the Open Men and Open Women Repechage Rounds. Portugal's Joanna Schenker earned the first female perfect score in the competition, sticking a go-for-broke aerial maneuver in the dying moments of the heat that propelled her into the lead. Schenker's last minute performance ended the run of the defending Women's U-18 Gold Medallist, Peru's Carolina Botteri, in her first year competing in the Open Women's Division. 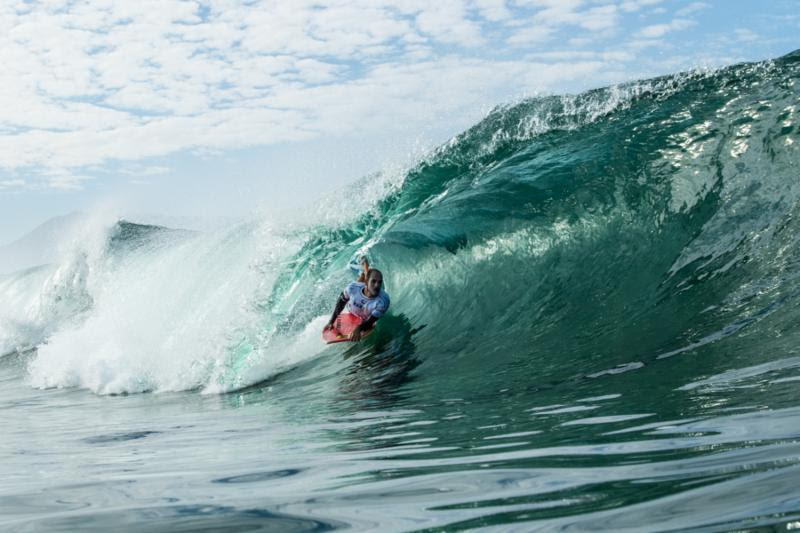 Iquique, Chile, December 11, 2015 - An intense day of critical heats transpired on the third day of action at the 2015 Iquique Para Todos ISA World Bodyboard Championship, bringing the competition one step closer to the Finals set for Sunday. Click here to see the team points ranking. On the men's side of the action, heats in the Open, Junior and Dropknee Divisions ran at la Punta 1, with finalists being decided in Open and Dropknee. Peru's Miguel Rodriguez came out victorious of a tight Open Men Main Event Final with a heat total of 16.87, barely edging out the 16.57 heat total of the home team hero, Chile's Alan Muñoz. France's Amaury Lavernhe and Chile's Matias Diaz were relegated to the Repechage Round where they will try to scratch back into contention for a Gold Medal in the Grand Final. "I am extremely happy. I was lucky enough to find some really good waves and make it to the Final. Competing against my idols, Amaury Lavernhe and Alan Muñoz, was incredible for me." Iquique, Chile, December 9, 2015 - The world's best bodyboarders took to the water on Day 2 of the 2015 Iquique Para Todos ISA World Bodyboard Championship, marking the first day of competition after a lay day on Tuesday. Day Two featured improved conditions with increasing pulses from an incoming swell, but a morning high tide and lulls between sets made for fierce, hard-fought heats as the athletes battled for position to find the waves with the highest scoring potential. The morning kicked off with the Junior U-18 Girls, who faced some of the toughest conditions due to the morning high tide. Japan's Shiori Okazawa was able to find the best waves and connect multiple maneuvers before the waves washed over the exposed reef, notching the highest women's heat total with 14.20 and highest women's scoring wave of 7.27. Following the Junior U-18 Girls, the men took to the water starting with Round 1 of the Junior Boys U-18 Main Event. The first men's heat exemplified the level of competition present at this world championship, as Brazil's Socrates Santana scored a heat total of 14.20 narrowly edging out France's Mil Delage's score of 13.27 for first in the heat. In the following heat the defending ISA Junior Bodyboard Champion, Iquique's Yoshua Toledo, reminded the competition that he intends to repeat his title by finishing on top of his heat with a two wave total of 10.20 over Yazdanny Castro's (CRI) 9.16 and Luis Zambrano's (VEN) 4.40. Iquique, Chile, December 7, 2015 - The 2015 Iquique Para Todos ISA World Bodyboard Championship was officially declared open in Iquique, Chile, marking the start of a week of intense competition to come. 2015 IQUIQUE PARA TODOS ISA WORLD BODYBOARD CHAMPIONSHIP OFFICIAL PRESS CONFERENCE TO BE STREAMED LIVE!